Japan Airlines business class seats, or 'Sky Suites' as they are known, stretch out into 2 metre long fully flat beds and also feature retractable dividers that allow passengers to create private spaces. Japan Airlines business class seats, or "Sky Suites" as they are known, stretch out into 2 metre long fully flat beds and also feature retractable dividers that allow passengers to create private spaces. Exclusive fare! Available offline only, contact our Airfare Consultants to book. Virgin Australia flies 5 days a week to Hong Kong. The service departs from Melbourne and is operated by an Airbus A330-200 featuring the airline's award-winning business class 'The Business'. Oman Air partners with Malaysia Airlines to/from Australia with fantastic value fares available to Europe via KL and Muscat. Fares with Etihad via Abu Dhabi, then Oman Air to Europe via Muscat, are also available from select ports for a premium. Inquire for details. United Airlines Business Class cabins feature state of the art business class seats that convert into fully flat beds and passengers are provided with luxury bed linen from Saks Fifth Avenue. The cabin is laid out in a 2-2-2 configuration with forward facing seats. Austrian business class seats feature a fully flat bed that extends to almost 2 metres in length, an innovative air cushioning system providing greater comfort and an integrated massage function. Thanks to Scandinavian Airlines' codeshare agreement with Singapore Airlines you can fly to Copenhagen via Singapore onboard Singapore Airlines award winning business class and then onto your choice of over 50 European destinations. 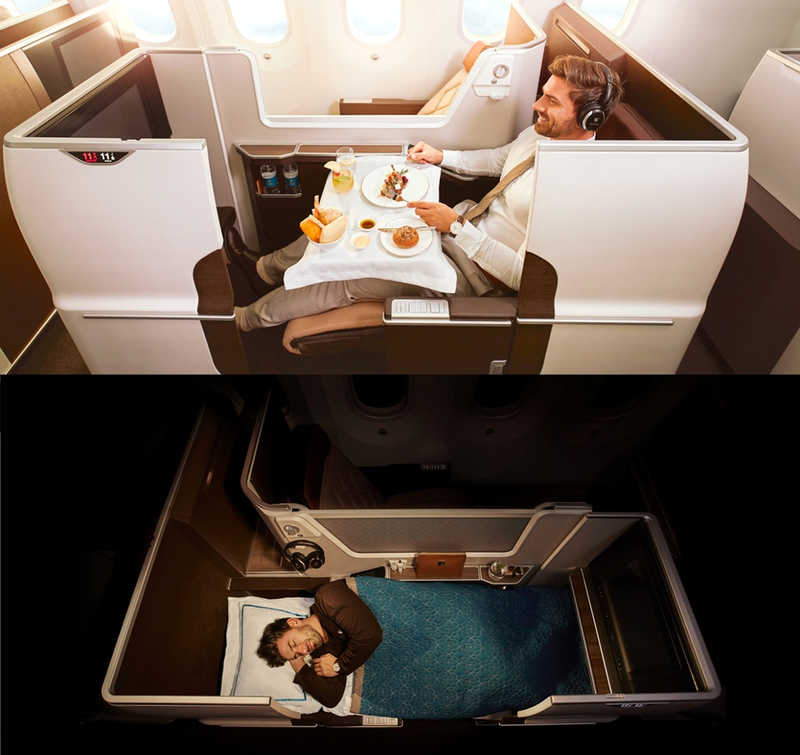 Korean Air has a variety of different business class seats, including their 'Prestige Suites' with fully flat beds whihc feature on flights out of Sydney and Brisbane to Seoul and also on flights to Europe. Air France features a recently updated Business Class cabin with adjustable seats that convert into fully flat 2m long beds, 1-2-1 cabin configurations providing direct aisle access aircraft, and hours of on demand entertainment via your 15-17 inch touch screen TV.